When you hear the word Christian, is the first word you think of “mercy”? We’ve learned that the Gospel takes root in poverty of spirit, mourning our sin, meekness in our understanding of who we are and who God is, and in our hunger and thirst for His righteousness. As these things take root, they begin to grow, bloom, and bear fruit. These next few beatitudes Jesus tells us how the Gospel should bear fruit in our lives. And again, starting place number one is not where we think it would be. We think being a Christian means we’re diligently reading our bible, going to church every Sunday, and not cussing as much as we used to. Jesus tells us the first fruits of being a Christian is mercy. Mercy is not pity and it’s not just giving a $1 to the guy on the street corner. Mercy means to withhold giving someone what he or she deserves. Mercy is withholding judgment and condemnation toward others for their sin and pointing them to Jesus as their ultimate sacrifice. What marks us as Christians? Does the world know us by our mercy or by our condemnation? By our exclusion of those who are different than us, or by our inclusion? We know by now that God was merciful to us through Jesus Christ, by giving His son the punishment we deserve for our sin. If we have been given this kind of mercy, should we not do the same to others? Once we are in Christ, we are to be merciful to others. To see them as those who are helpless and guilty. Of all the peoples in this world, we should be the most merciful for we have received the most mercy from the most loving God. He was not frustrated that others did not understand. He was not angered that they were not perfect. He didn’t picket their nightclubs or yell hateful things. He didn’t look down his nose at them, he didn’t turn them away, shun them, or isolate from them. He saw them and had compassion. Or as my wise teacher once said, He recognized “They were not the enemy, they were victims of the enemy.” We are to extend mercy, to show grace and compassion, for others. We are to offer Christ and pray that they receive relationship with the Father of Mercy. As an act of gratitude for receiving mercy from our sovereign LORD, we are to share that mercy with others. It is the only response for being saturated in this gift of mercy . . . pouring it out onto others. 1. Read Matthew 5:7 and write out the definition for the word mercy. 2. List some ways you have received mercy from God or from others. 3. Do you struggle to show mercy to others? 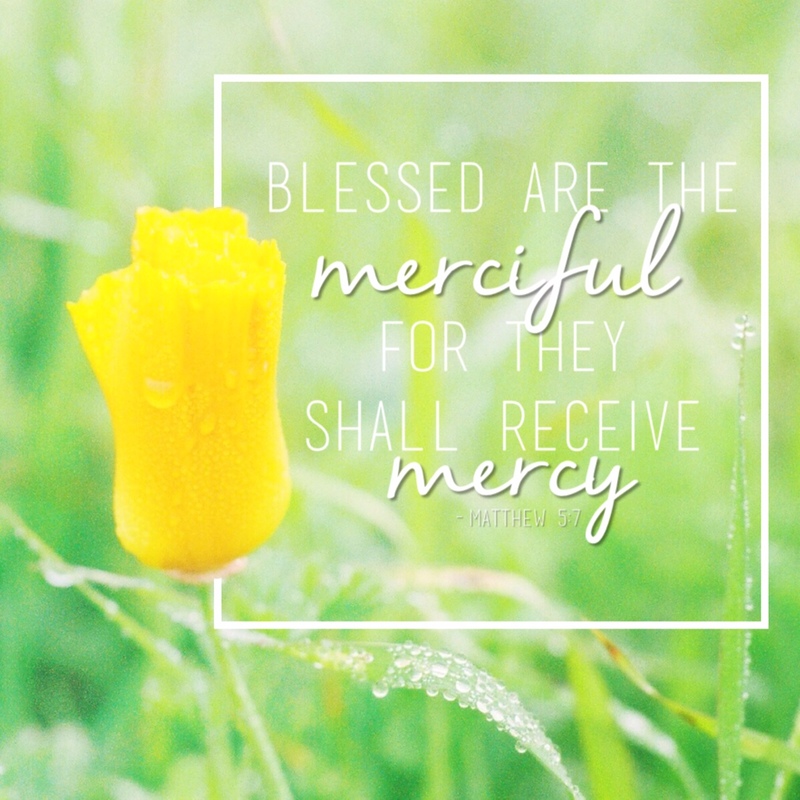 How does understanding this beatitude change your view on mercy?